This past Spring I went for a walk in the park with a friend. She wanted to get out into the sunshine and I wanted to take pictures of the tulips that were in full bloom. We had a lovely time together, chatting about silly TV shows and snapping pictures. Later that night, the pain started. It was radiating from my low back down my leg. Every time I moved it felt like electricity shooting down to my foot. Now, I’ve injured my back a couple of times before so I knew the drill, rest, ice, heat, stretching and strengthening. I did it all and slowly the pain subsided. Just a few days ago I was amazed to discover that I could walk and sit without pain and the strengthening exercises were getting much easier. Then I woke up with my allergies going haywire. I should have gone to the doctor right then, but I didn’t. I thought I was tough and I could get through it on my own. Oh, how wrong I was! I had a terrible sneezing fit and I felt my back go out immediately. I knew I was in big trouble when I couldn’t get out of bed the next morning and I was dragging my foot as I walked again. I don’t write this so you’ll feel sorry for me. By the grace of God, I’m going to be okay. I write this with the hope that you will be encouraged. We all have setbacks in life. They usually come at the must inconvenient times. But it’s just a setback, not a permanent destination. No matter what obstacle we face God is greater than it. For me the obstacle is an old back injury rearing its ugly head. For you, maybe it’s different, a divorce or bad breakup, the loss of a loved one, problems at work or a feeling of despair that you can’t put into words. Whatever you’re facing I want you to know that God has you covered! 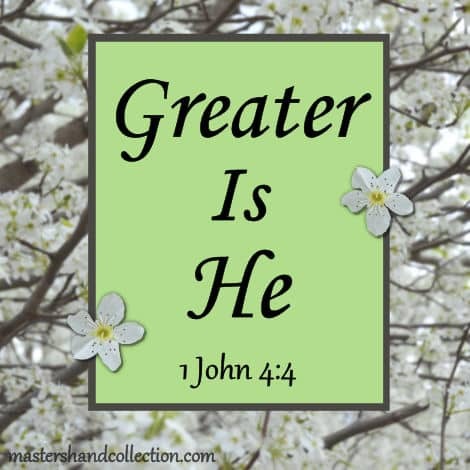 He loves you, He will see you through it and He is definitely greater than any setback we face! And through the rivers, they will not overtake you. I love this verse and I come back to it often. The meaning is simple but the words are so powerful. We are going to have trials in our lives. But God doesn’t take us into a trial just to drop us off and leave us there. He promises that He will be right there with us. He knows that we will emerge from the flames stronger and better equipped for whatever the next obstacle may be. Are you facing a setback right now? If so, then I pray that you will be encouraged by knowing that God is with you. He will use this time in your life to lift you up and show you His love and compassion. You may not be able to see it now, but you will emerge on the other side of this trial stronger and with more resolve to live for Him. 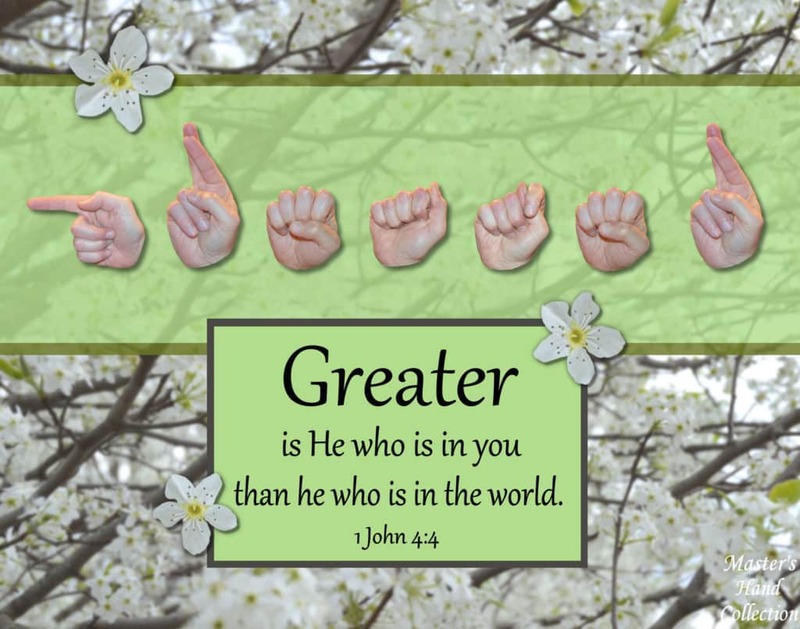 Setbacks will always come and go, but our loving Father will be with us through it all because He is greater! Until next time, God bless! For I know that my Redeemer lives. A few years ago, God told me that I would live the life of Job. Now, that’s a pretty big pill to swallow! And if I’m completely honest, I wasn’t thrilled with the news. No one wants the life of Job, because everything he had was taken from him. True to His word, God has followed through on His “life of Job” promise to me. I have faced many trials in my life. Loved ones have been taken from me either through death or through broken relationships, my livelihood has diminished, my health has suffered and my faith has been tested. I can see the parallels between Job’s life and mine. 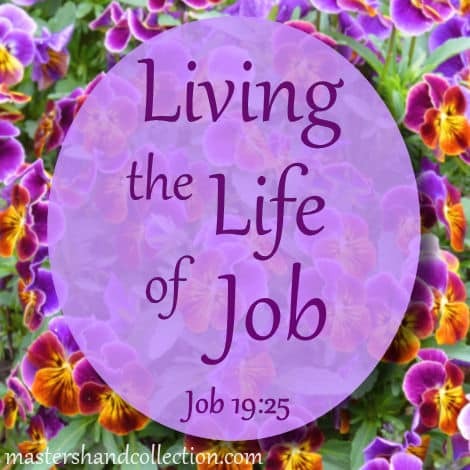 And I find myself referring back to the book of Job for inspiration often. 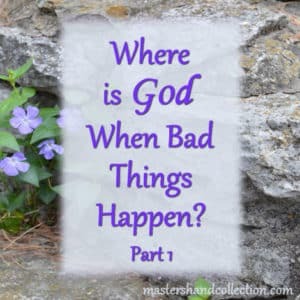 With everything that Job went through, it would’ve been easy for him to curse God as his wife told him to and no one would have blamed him for it. (Job 2:9) But Job trusted God and refused to curse Him no matter what circumstance God placed him in. When everything seemed lost, Job said, “The Lord gave, and the Lord has taken away; Blessed be the name of the Lord.” (v. 1:21) This kind of resolute belief Job had, inspires me to get up, keep moving forward and remain faithful to God no matter what circumstance I’m in. God has allowed my faith to be tested, just as He allowed Job’s to be tested. But He didn’t do it to hurt me. He did it to bless me and teach me the lessons I need to know as I move forward in my life. And with each trial and lesson God has shown me His plan and will for my life in a way I couldn’t see before. 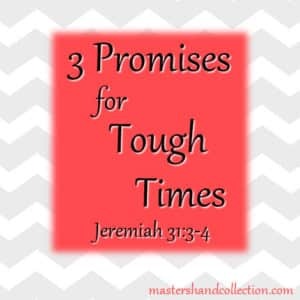 Proverbs 17:3 says “The refining pot is for silver and the furnace for gold, but the Lord tests the hearts.” God allows us to go through trials and He tests our hearts. But He doesn’t do it as some kind of punishment. He knows what is ahead and He is preparing us for it. He is refining us like silver or gold, melting us down to our core, taking the impurities out of our lives and leaving us with all of the good that He has in store for us. Yes, Job faced many hardships and he was tested. But the lesson that I take away from reading the book of Job is not one of defeat. It’s a story of great faith and triumph over adversity. Through it all, God was there right next to him. He never left Job. 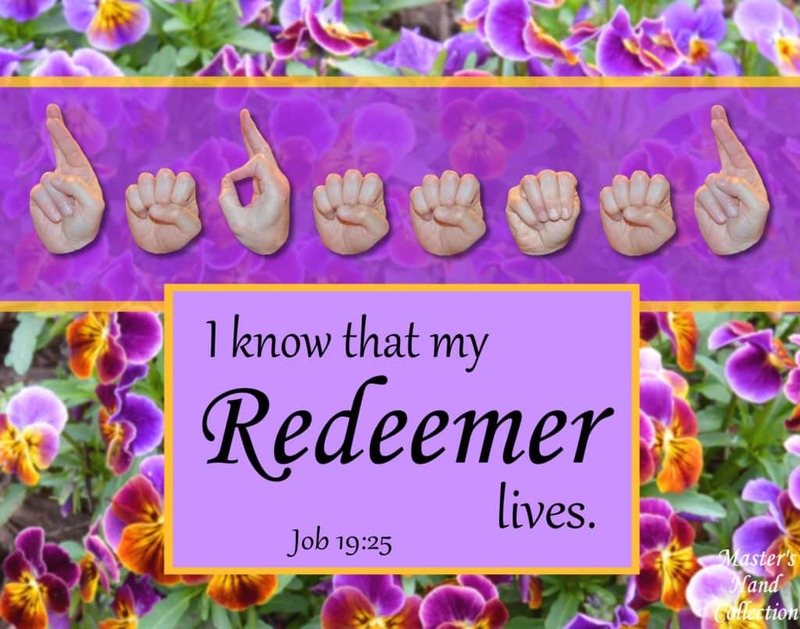 He was Job’s mediator and ultimately his redeemer. By sending Jesus to die for our sins, God has given us a redeemer and mediator. Right now, this very moment, He is seated at the right hand of God interceding on our behalf. (Romans 8:34) When we face trials and our faith is tested, we can have complete confidence that Jesus is still there, in the fight with us. It’s been a few years now that I’ve been living the life of Job. It’s been a hard path, full of unexpected twists and turns. 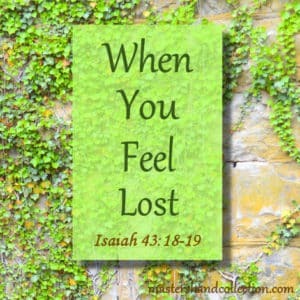 But, when it seems that the world is against me, I can take comfort in knowing that Jesus is always for me. No matter what comes my way, I can face the future with confidence because… I know my Redeemer lives! If you are facing a trial in your life today, I pray that you will turn to Jesus and trust in Him. 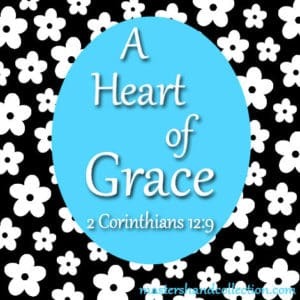 He loves you and wants to refine you like the silver and gold that you are. To find out more about Accepting Jesus as your Savior, click on the link or go to the Accepting Jesus tab above. Cast your cares on Him, because He cares for you. (1 Peter 5:7) God bless!